Before I was a Mum I used the old phrase "I slept like a baby" regularly. Now as a new Mum I realise how daft that saying is as babies don't tend to sleep that well, well not usually..
We are very fortunate that Noah loves his sleep. When he was a newborn he would wake every 2 to 3 hours for a feed but as the weeks went by his sleep periods increased in time and now at 3 months old he sleeps through. Usually between 12 or 14 hours. There have been many occasions that I have thought, ok it's getting a little late now and I have actually had to rouse him, much to his disapproval. So actually the term "sleeping like a baby" is very apt for Noah and I, for now anyway. He has been sleeping like this for a good couple of weeks now and I know that I shouldn't count my chickens just yet as that dreaded four month sleep regression is just around the corner. I must admit that I am hoping he skips that part! He is also still sleeping in his moses basket and in the next week or two we need to make the transition to cot. It's so sad that he won't be in his moses beside me anymore. He will still be beside us though as he will still be in our room but he's going to be in his big boy cot. Once we have moved into our new home we will be decorating his new bedroom and a year or two down the line will be looking into buying him his first proper bed. There are some fabulous children's beds on the market from bunk beds to beds shaped like cars. 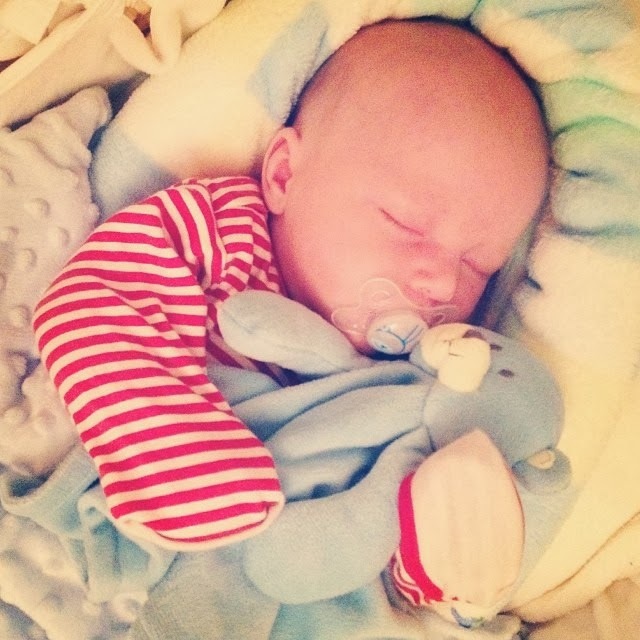 But for now I will enjoy him while he still fits in a cot beside his Mummy. This is a PR collab. Books played a huge role in my childhood. 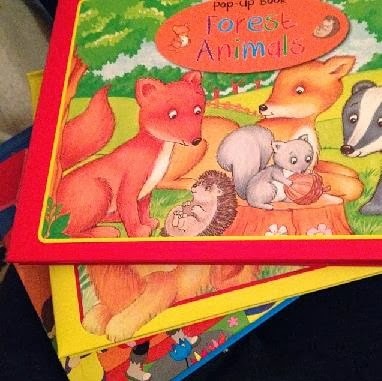 Many of my childhood memories contain a book or two from Spot the Dog to James and the Giant Peach. I was always encouraged to read from my parents and was helped every step of the way. From toddler to teenager, I always had my nose in a good book. To this day I still love to indulge in a great novel, it's just finding the time now I am a new Mum. - Communication. Reading to your baby teaches them all about communication. Not only do they find it entertaining but books also introduce numbers, letters, colours and shapes in a way that is interesting to them. - Learning. Your child will gain listening, memory and communication skills from reading. And will learn all about the world around them which lets there imagination shine. - Bonding. It's a time where you can sit down, cuddle up and read to your child. A special time that could be part of your nightly routine. Your child will really enjoy this one on one time and feel safe and secure. Whatever age your child may be. Reading is something I hope Noah enjoys just as much as I do and at just 3 months old he already has quite the collection of books. One shop I visit regularly for books is The Works and at the moment there is an incredible offer on, 10 books for £10! Which is perfect for building up your child's library. One of my new years resolutions is to start and stick to a diet. I decided to try out Slimming World as I am forever hearing positive weight loss stories and positive remarks about the diet. Although I wouldn't call Slimming World a diet, it is more like a lifestyle change. It changes the way we choose and cook our foods and I have already learnt so much in such a short space of time. I did start Slimming World earlier on in the year but wasn't fully confident in it so I decided to give it another go this week and to stick at it and I feel a lot more committed this time around. I am on the Extra Easy plan and it is just that. Extra easy. Once you get your head around all the ins and outs it's like riding a bike. I try to have three meals a day but do find that I tend to miss or skip breakfast. When I do this I have a supper instead. I have always been more of a night time eater and I can't change that. That is why Slimming World is great. You don't need to change what you like and want, it's all in moderation and you tailor it to what works for you. There are free foods, superfree foods, healthy extra's and then the foods you have to syn. I bet it all sounds like gobildygook but once you are doing it, it all makes sense. I get 15 syns a day to use which I could spend on a curly wurly (6 syns) or even a bag of quavers (4 syns) and much much more. If you want it, syn it and you can have it! Some people go syn free all day by filling up on free and superfree foods and then splurge using all the syns they have saved throughout the week. Which is great if you haven't kicked the takeaway habit. I have had some fab meals this week; beef casserole with roasted, potatoes, parsnips and carrots. Tuna pasta. Piri Piri chicken, rice and peppers. 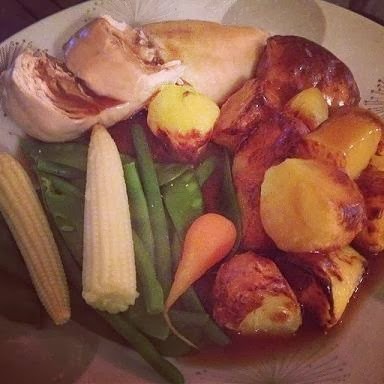 Roast dinner. Chicken tikka. I've even had chips!! All slimming world friendly and containing no syns! I had put on weight before becoming pregnant, during and after so I have a lot to lose. I am aiming to lose 3 stone so I will be here for the long haul but I will be blogging all about my adventure and maybe post a recipe or two. I also intend on being more active. Even if it is just taking Noah out in the pram for a good half an hour in the afternoons. I have been trying to get out and be more active but the weather is dreadful. I can't wait to be able to go on long walks on milder days, Noah loves it too. On to the scary part. It is my first weigh in tomorrow! Wish me luck! 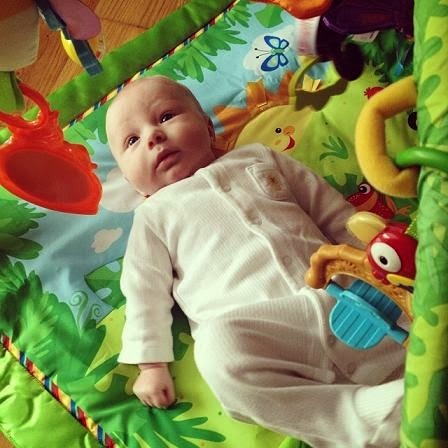 How on earth are you 3 months old already Noah? I can't believe it. You seem to learn a new trick everyday now and you are really coming into your own. You are amazing! You are becoming so cheeky and giddy but you also know your own mind and are so strong willed. You have such a big character for someone so little, it's incredible watching your personality develop. You are still a Mummy's boy, which I love. Our bond just seems to grow and grow each day. You love Daddy too and it's so endearing watching you spot him and smile as he comes in from work. You were weighed last week and was 13lb 11oz! Big boy! 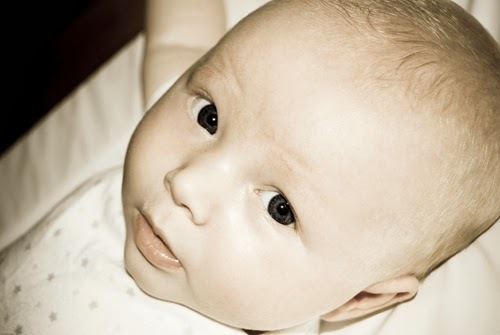 You have almost doubled your birth weight and have a healthy and steady weight gain. I can really feel your weight now. 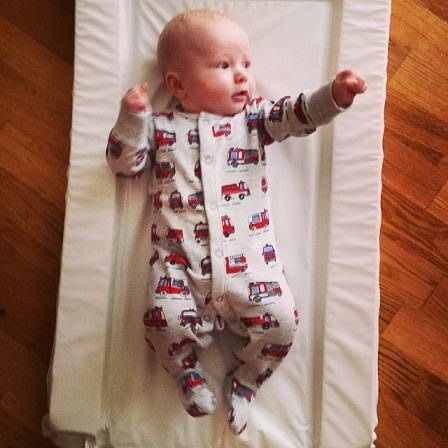 Most 0-3 baby grows are too small for you now but 0-3 vests and trousers still fit. The issue with the baby grows are that they just aren't long enough on the arms, legs and feet. So bit of a dilemma at the minute whether just to pack away all your 0-3 and bring out your 3-6 wardrobe which is waiting for you. Or go through all the 0-3 and see which still fits. I don't want to be washing and sorting through two different sizes as although I know which is which Daddy won't when he comes to dress you. I was putting off moving you into 3-6m for as long as possible cause it's a bittersweet feeling. I'm going to have a sort through everything in the next few days. Other than the occasional trapped wind and runny nappies you have been great. Recently the trapped wind and belly ache has reared it's ugly head again. You get such bad trapped wind that you end up hysterical but nothing a bit of gripe water, cooled boiled water and a tummy rub doesn't fix. You have been great after all your injections too really. You have been very clingy after them but we have always given you calpol just incase. You still absolutely love your milk! When you are feeding people always comment on how much you are enjoying it and that they have never seen a baby guzzle like it! We did switch onto hungry baby milk and it agreed with you but after a few weeks of consideration we switched back to regular Cow and Gate so we have hungry baby milk to move onto further down the line if you need it. Otherwise we would of had to move onto solids early if milk wasn't satisfying you anymore. You now drink 5oz every 3 hours during the day and have 6oz at bedtime which usually sets you through the night. Your sleep has so improved this month! You still won't settle until late though, sometimes 11pm, sometimes midnight. You now take frequent naps throughout the day which is brilliant because it makes you a much more content baby. You do have the occasional days where you think napping is a waste of time. We have also cracked the moses basket situation and you are more than happy enough to sleep in it through the night. You usually sleep for inbetween 12-14 hours a night. Most of the time without a bottle and most of the time I have to pull you in bed with me in the morning as you do enjoy a cuddle. As you are settling so late on you do sleep until around 11am so we are trying out best to get our times better. It's a work in progress. You are getting better and better though. I think we will be moving you into your cot in the next week or two. - You are getting there with your head control now. You can be wobbly when you can't be bothered but other than that you are great. - You are almost there with laughing. There have been times we have thought was that a laugh!? I think in the next couple of weeks we will have a giggler on our hands. - Sleeping through. You now sleep through! Although you don't settle till late on you can go 12 hours without waking for a feed. My little man loves his sleep. - Playing with toys. When on your play gym you now reach for the toys. You can grab, pull, twirl, hit at the dangling toys. If you place a toy on your lab you will try to grab it and bring it up to your mouth. It's still hit and miss but more often than not you can get a hold of it. - Hands. You have really discovered your hands this month. You are forever chewing on them or have a few fingers in your gob. Which makes you a very dribbly baby. - You can grab your dummy and pull it out of your mouth now and you think you are so clever when you do! - You have realised that shouting and being vocal gets our attention. If you are led down on your changing mat or play gym and we nip into the kitchen to grab a cup of coffee or put a wash on you will shout for us. Literally shout. - Your dummy. We try to have you without it during the day but whenever you get sleepy or upset you want it. When we put it in your mouth you make an mmm om nom noise like it's the best thing ever. Uh oh. - TV. You are even more of a tele addict this month. In the mornings we will sit down together and watch This Morning while I feed you your bottle and I sip on a coffee. Our little morning routine. You often get bored with your play gym and end up watching the TV instead. - Going out. You love being out and about getting fresh air. I find if we have a day in the house you tend to be a lot crankier and hard work. Even a quick brisk walk around our area does wonders for you. I hope the weather picks up in the following few weeks so then we can have more walks. - Logan the Lion. 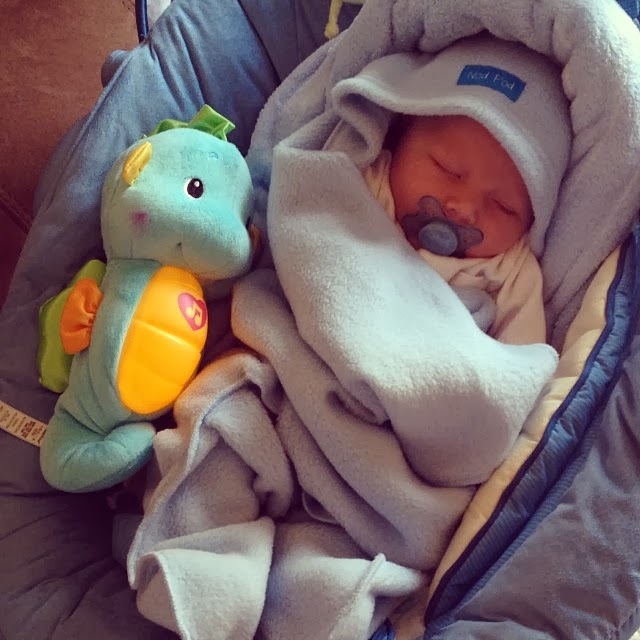 We bought another toy from Lamaze this month and I chose Logan the Lion for you which was a great move by Mummy because Daddy wanted to get you the Robot. You are obsessed with him and love chewing on the purple star that is dangling from his paws. Lamaze is fantastic. - Snuggling in my arms. I am so happy that you still love being snuggled up. Your favourite place is in my arms with your head snuggled into my chest. I am loving every second while you still like it. - Blankets - You love blankets whether they are knitted, fleecey, woolly, muslin. You not only like to snuggle up in one when napping but you like to play with them too. - Changing mat. You are so content just laying on it kicking about or watching what Mummy and Daddy are doing. - Nappy changes. 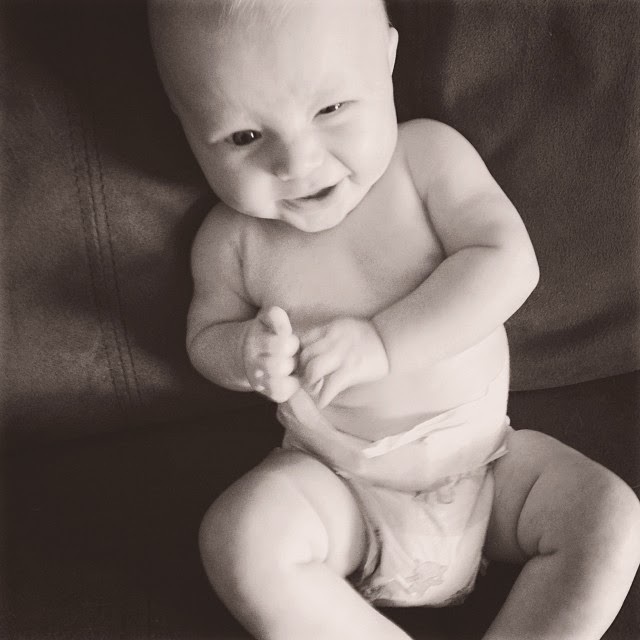 So strange but you love having your nappy changed and often smile and babble all the way through it. - Nappy free time. You love having no nappy on and usually wee all over the place which you find highly amusing but we like to give you some time to kick about with no nappy on. - Your projector mobile. Your Nanny bought you this for Christmas and you love to lay in your cot watching the mobile spin around. It's not good for nap time though as you usually become so focused on the movement that it ends up waking you up. - Being carried. You sometimes get cranky when we are sat down with you and prefer for us to walk you around the house. Which can be difficult because at the moment we are living in a tiny bungalow and with all your bits around it is like an obstacle course. - Tummy time. We try every day but every day you cry and want to be put back on your back. - Naps. We do occasionally struggle to get you to take naps during the day. You do sleep well through the night so we can't really complain but because you don't like to nap you can become crabby throughout the day. We have to try really hard to get you to nap and then when you do fall asleep you only cat nap for a maximum of 30 minutes. - Early mornings. If I try to wake you up as it's getting late you usually whine. You are like a teenager in a babies body! - Getting dressed. You still really hate being dressed and normally protest. I don't know where the time is going. 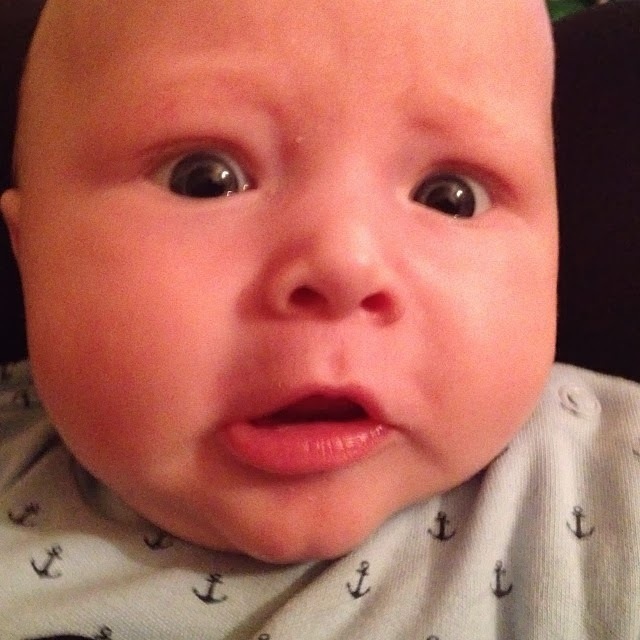 Before I know it you will be a year old, it's so frightening! We love you so much Noah Nicholas. This isn't even half of it, it's ridiculous! This is a picture from a few weeks ago so his wardrobe looks a bit different now. The first third of the clothes no longer fit so are no longer in there. I have stored some and given some away. 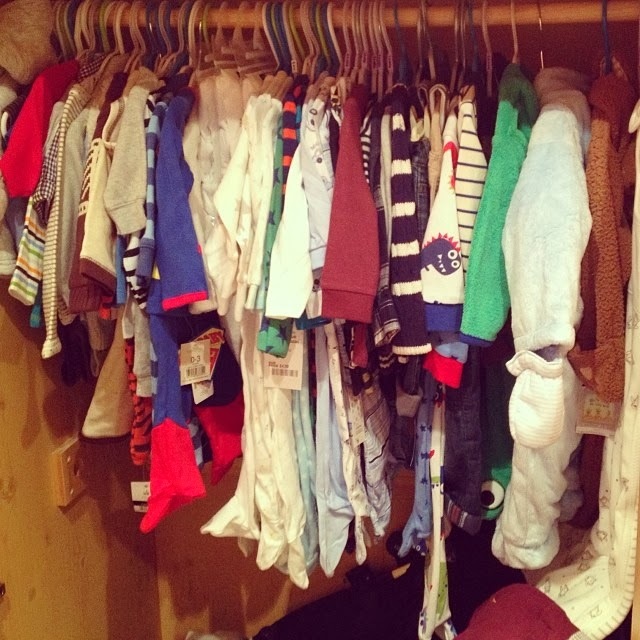 He now has more 3-6m vests, babygrows and outfits in there hung up. When we bought our nursery furniture we opted for the cotbed, wardrobe and changing unit bundle which is fab but I also wish we had bought the drawers as it would be a lot handier having his vests in drawers rather than hung up or in baskets. Milk! He is only 13 weeks old after all. I have a feeling though that he will love his food once we being weaning him. I think he will be a big eater. Little greedy guts. This was my boy in blue yesterday when we were out and about with Daddy. We were over in my hometown doing a little bit of shopping before visiting my family. 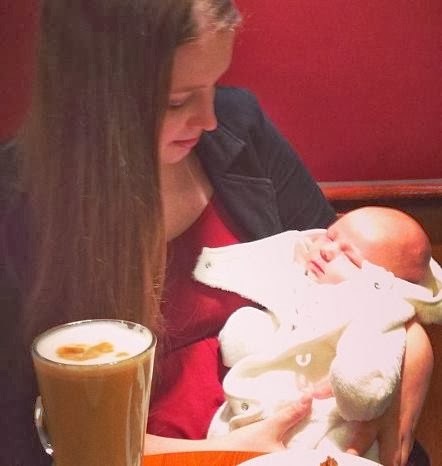 We were having some iced lemonade in Costa while Noah was having a doze. After I took this photo my Mum dashed out of her work to take him back with her to show him off. So she wheeled him away in her pram whilst we were sat there think ok then! Crazy Nanna! Over the past few weeks Noah has really begun taking an interest in his toys. Especially his play gym. It's so incredible watching him grab at his toys and babble at them in fascination. We have quite the collection of toys in his box. It's a guilty pleasure of mine, buying him a new toy every time I pop into a shop. I can't wait until he properly plays with them rather than grabbing at them. I made you and carried you for nine months. You are my first born, my baby, my son. You are the love of my life, my pride and joy. Your big smiles and cheeky grins. Your gorgeous blue eyes that make my heart melt. Your giddy and funny personality. When you smile at me when you have just woken up. The comforting noses you make when you are in my arms. Your little hands and feet. How you are the happiest in my arms. Your cute babbles and demanding yells. My little man preparing for our very first Valentines together. What more can a woman want? 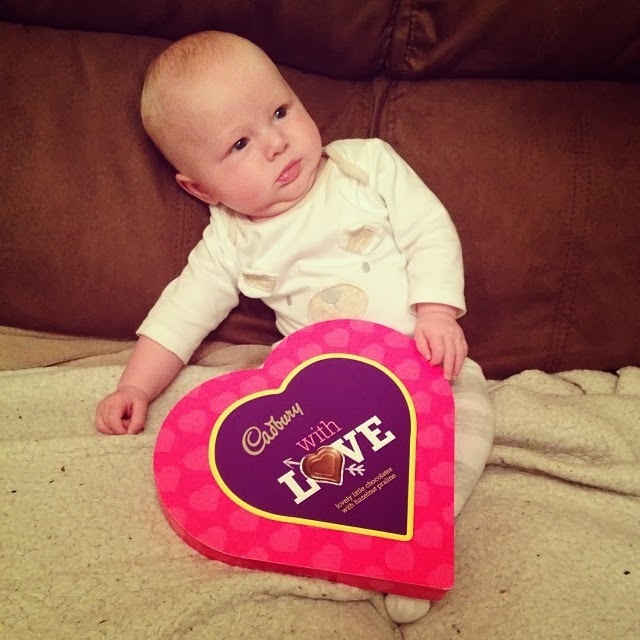 A cute baby and a box of chocolates. Oh and Nick of course! We've exchanged presents tonight because tomorrow won't be much fun as I have to take Noah for his second round of injections and then I am off to the dentist. Not very romantic. Hopefully we will spend the evening together all cuddled up watching a film. That is my idea of romance. I'm a lover of all things photography and love displaying my photo's around my home. When CanvasDesign contacted me regarding the possibility of a review I was more than happy to oblige! It took me a good few hours to decide which picture to go for as it had to be good quality at over 500kb and the majority of my photo's are taken on my phone. I opted for an image of Noah I took on my DSLR and emailed it through to them. The canvas arrived less than 48 hours later which was amazing. It was well packaged too! I cannot fault the canvas at all. It is excellent picture perfect quality, very sturdy and well made. If I had of ordered it myself I probably would of gone for a bigger size although most people would be happy with this size. I'm just picky! Now that I have experienced CanvasDesign first hand and know the level of quality you receive for a very reasonable price I wouldn't hesitate to order from them again! Infact I am already thinking of purchasing one for my Mum for her birthday. The website is simple to use, the delivery is quick, the prices are fantastic and the canvas itself is top notch quality. Huge thumbs up from us! 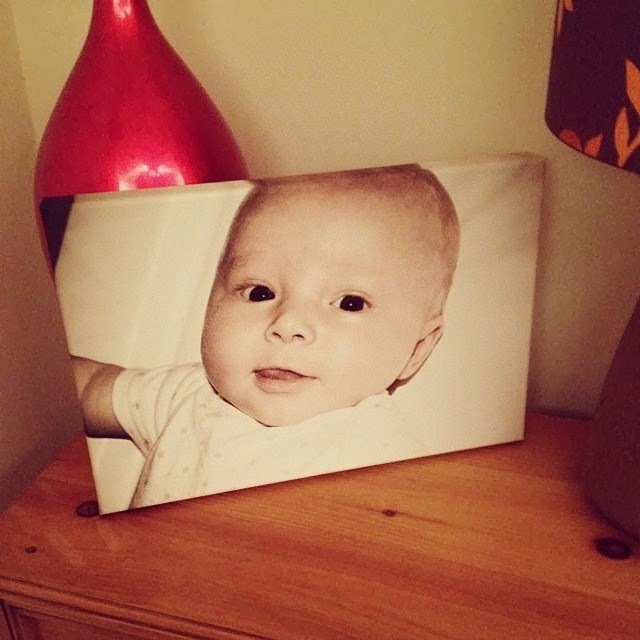 How would you like the chance to win your very own canvas? Not only were CanvasDesign generous enough to send me a canvas to review but also want to give one away to one of you guys! All you need to do to enter is to use the Rafflecopter below. Please read the T&C's at the bottom of the page too. Good luck! 1. 1 winner of 1 canvas of their choice. Any size from 6x6 to 40x40. 3. Winner will have to email me their details with their photo of choice which has to be over 500kb. 4. Any incomplete entries will be invalid. - I was sent the canvas for the purpose of this review. All opinions are my own. This is one of my favourite pregnancy pictures. I think I was around 6 months pregnant or so. This was before all my stretchmarks appeared and I was rather small at this point. I hadn't put much weight on at this stage either. 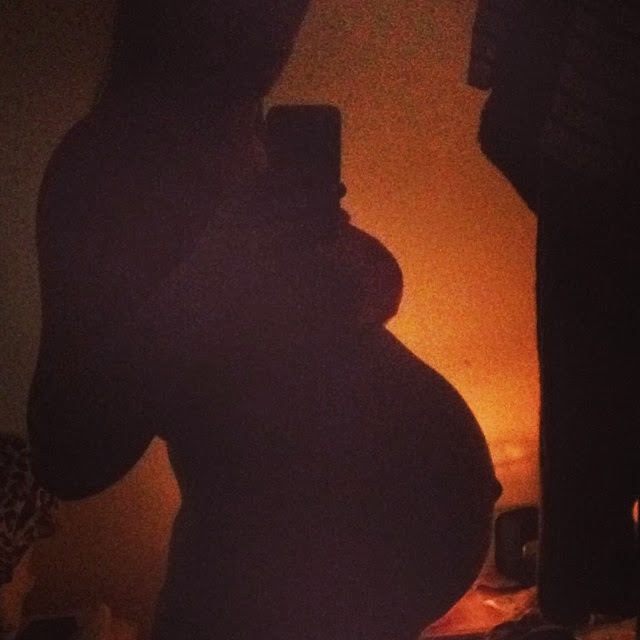 I love this picture so much as it just sums up my entire pregnancy; peaceful. I felt in my element when I was pregnant and I loved every second of it. Now I know slimming tablets have had something of a battering in the press and I would only use them as a last resort but, having said that, you can get some great slimming aids these days. Online retailer Slimming Solutions has a great selection, including the highly rated Slim Bomb, but before I make any purchases, I’ll make sure that the tablets are 100 per cent right for me. After January, the shops are always full of fitness DVDs fronted by some celebrity or other. I never normally bother with them, but since having Noah, my priorities have changed. As you’ll probably know, raising a child can be time-consuming, not to mention tiresome. Once baby’s been put to bed, the last thing I want to do is to don my shorts and t-shirt and hit the gym. That’s why I’m seriously considering buying a fitness DVD this year. I can pop it on when Noah’s napping, so it’s a much more convenient way to burn some calories. Trouble is, I haven’t a clue which one to choose! It is important that I fit my exercising in around being a mum, so that’s why I’m thinking about taking Noah along with me. Walking is a great form of gentle exercise, so I’m thinking about getting some of my pals with children together and going for some nice walks. I’ve had a look at Walks With Buggies for some inspiration for when we get bored of strolling around the park. They have some great pushchair-friendly routes across the UK, so I’ll definitely be doing some of these once the summer rolls around again. These are just a few of my options and I am determined to succeed. Of course, I’ll be eating right too. Spurring me on is the thought of a whole new wardrobe to match the new me! Noah doesn't have teeth just yet so obviously we have no tooth brushing photographs so this gummy one will have to do. 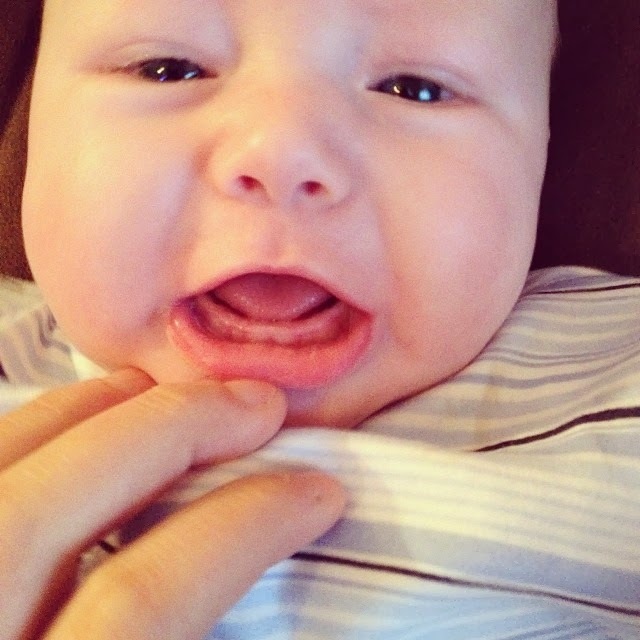 He has just started teething and you can see the teeth beneath the gums. Hopefully they won't make an appearance for a while though because I love his gummy grins! 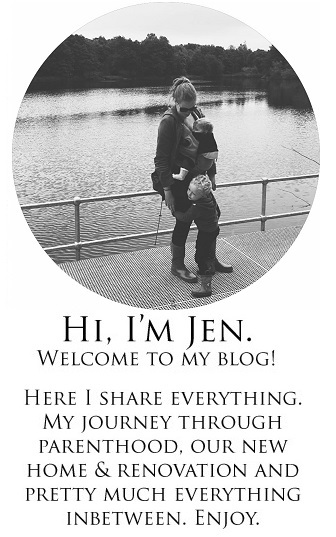 I was tagged by a few Mummy bloggers to do this tag, so here goes! I am on maternity leave until October. I will then be returning back to work but on a part time basis. My maternity leave it going way too fast. I'm in two minds about it. We would be able to afford for me to stay at home but we would have to make cut backs. So I have compromised and will be going back but less hours. Part of me wishes I could be a SAHM but I know that my wage will help us a lot and allows us to do many more things with and for Noah. We did do when Noah was newborn as he would not sleep in his moses basket and would only sleep on me. Thankfully as he got older he became more and more comfortable with his moses basket and will now sleep in it. Most mornings I do bring him into bed with me when Daddy goes to work as I like to be close to him. Best of both worlds I think! Just the one? I could name a dozen. I would have to say large muslin cloths. Got to be super soft and the larger the better. They are fantastic. We use them for blankets, as comforters, to clean up, to dry up, for sick, keeping his bottle warm, for play time (peekaboo), changing mat, head rest. Endless uses for them! I would like to have 3 or 4. Happy with our number 1 at the moment and have plenty of time for others! Not as often as we should! We need to make more time for one another but when we do go out we just talk about the baby all the time, miss him and want to get back to him. We went to see The Hobbit and half way through we looked at one another and both said we missed him! Noah loves the TV! He seems to have taken a liking for Spongebob Squarepants. He will watch anything though! Outfits in new born size. I preferred him in his cosy babygrows rather than proper outfits. Little jeans and shirts may look cute but they don't look comfortable on their soft delicate skin. 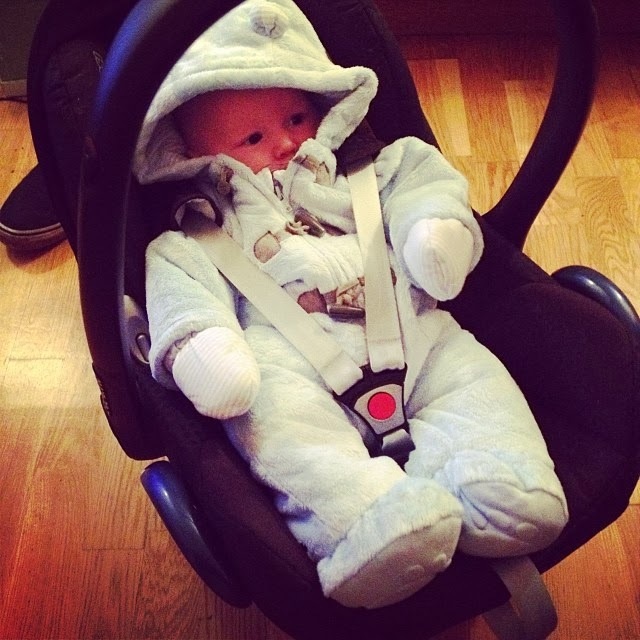 I want him to look like a baby for as long as possible, he has the rest of his life to be suited and booted. Milk? 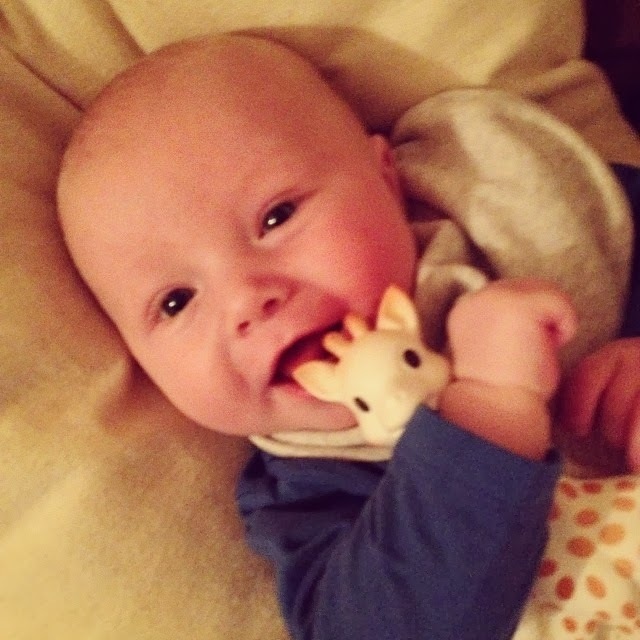 I have a feeling that Noah will love his food once we begin weaning him. We have the one. I can't drive but Nick does. I have put on a lot of weight, most of it after pregnancy. I can't seem to find the motivation to diet. I blame the weather! Disneyland Florida. When he is older and maybe when he has a brother or sister. A road trip across America! A lifelong dream a long with living in Spain. My life has been turned upside down in the best possible way. Not only has my life changed but I feel like a different person all together. Having a baby makes day to day life much more tiring but much more enjoyable and totally filled with love. My life has never been so good. Noah gives me a big gummy grin. My cheeks hurt from smiling so much at him cause he just fills me with pride and joy. I shop all over the place! Next, The Essential One, Boots, Tesco, Mothercare, Asda, Ebay, Beebies Baby Store. 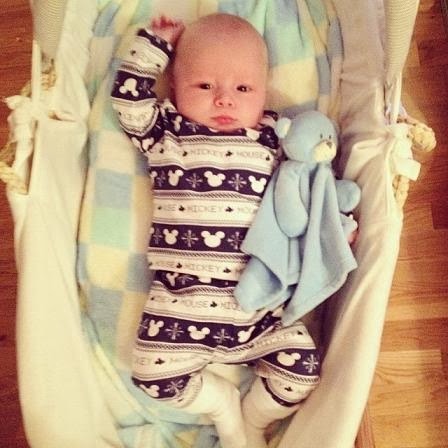 One of my favourite places for baby clothes has got to be Tesco! Cheap and gorgeous bits and pieces. Well you can tell I am a proper Mum now cause the skincare products I use are baby wipes and baby lotion! When I use make up I like Maybelline Dream Matte Mouse, Maybelline Powder, MAC blush, eyeshadow and eyeliner. I use lots of different mascaras. My favourite being They're Real by Benefit. I like both but Pampers are easier to find. Always! Isn't it why we are here? Everything! From changing his dirty nappies to getting cuddles curled up on the sofa. 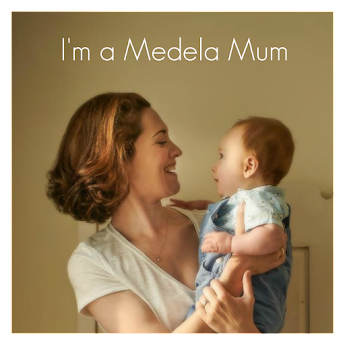 Every part of being a Mum is the best part. 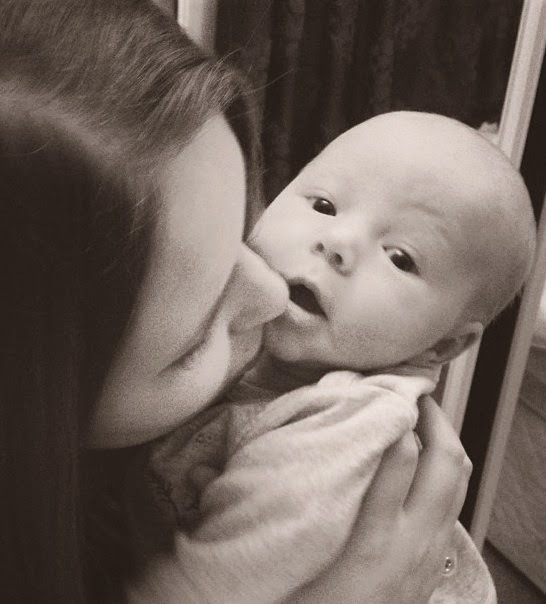 I love being Noah's Mummy so much. I came out of what!!!? This was one of the first photo's taken of Noah. 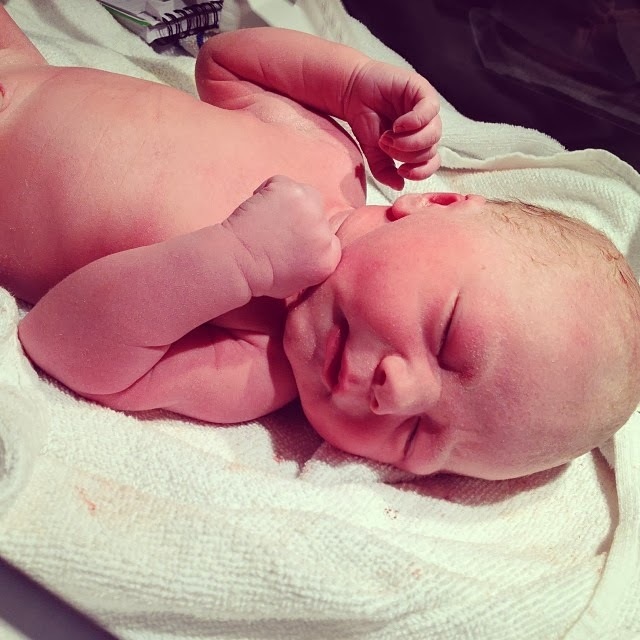 It was taken just after he had been born and Daddy was snapping away while I was being stitched up. Ouch. Noah was born at 6:23am on the 12th November. He weighed 7lb 2oz. 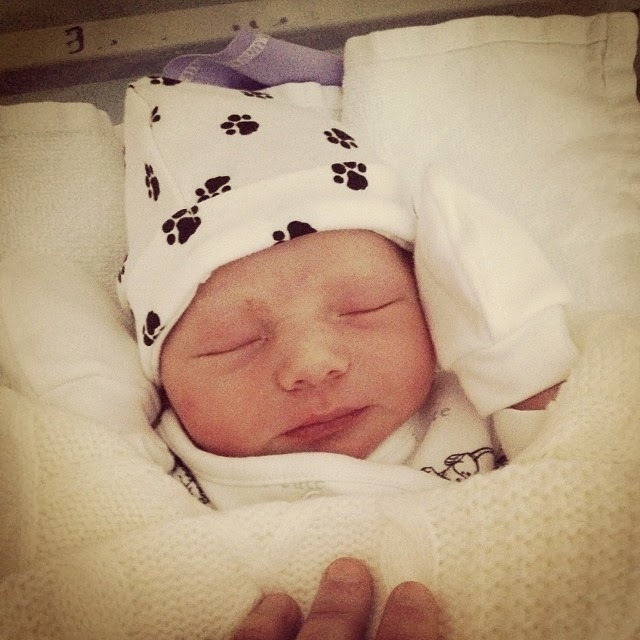 He was placed on my chest straight away and I had the first cuddle while Daddy cut the cord. I still can't believe how beautiful he is. Splish splash Noah's taking a bath. 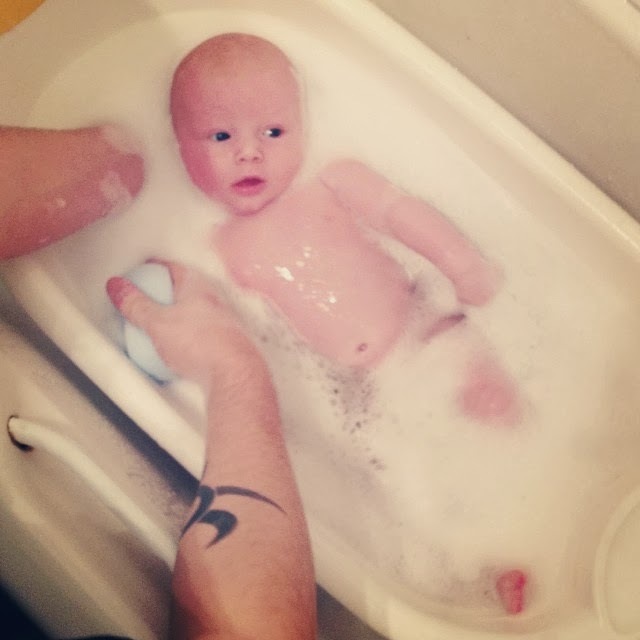 He loves having a bath and kicks around like a crazy baby. I can't wait to eventually take him swimming as I am sure he will love that too. He isn't a fan of getting out the bath and getting dried though and usually screams the house down. 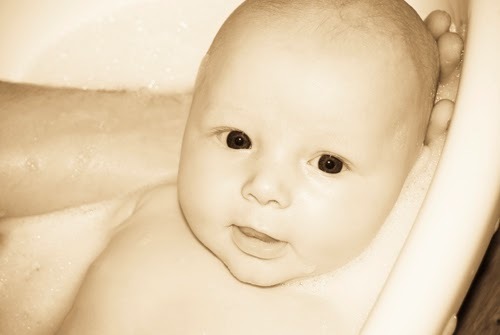 Is there anything that smells nicer than a freshly bathed baby? I think not! I can't begin tell you how much I love this photo. I took it this Tuesday just after the health visitor came to visit. He was 12 weeks exactly and was just weighed at 13lb 12oz. She had just left and I propped him up on the sofa and he was being so cheeky, chatting and smiling away. 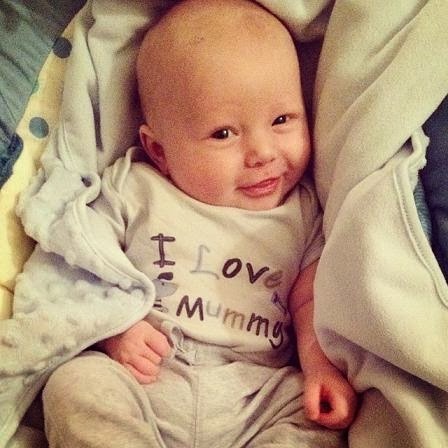 This has to be one of my favourite pictures of Noah and that says something because I have more than 3,000 photo's of him and he's not even three months old yet! It's getting to that romantic time of year, Valentines. Whether you are a fan of the day or not it's nice to spend precious time with your significant other. You don't need to spend a fortune, just letting your other half know that you care and that you appreciate them is enough. But if you are like me and like to go out on romantic dates then carry on reading. Since becoming parents Nick and I haven't had much one on one time with each other. We have had the occasional trip to the cinema, or quick meal out while Noah stops at mine or Nick's Mum's house but that is as romantic as it gets. Now that he is getting older it will become easier to make time for one another. I would like to try something different the next time we have the chance to have a date night. 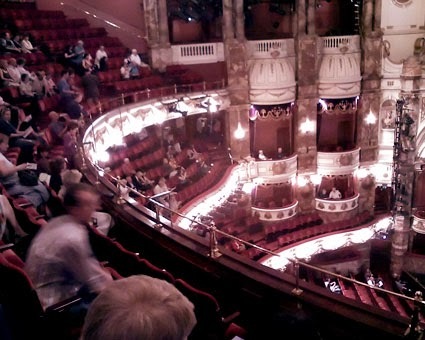 One thing I have always wanted to do is visit the opera. I am a big fan of musicals and have always wondered what opera would be like live. I can imagine it being mind blowing and very atmospheric. I hope I get to experience opera first hand one day. I would love to catch a Benvenuto Cellini eno production in London this June. 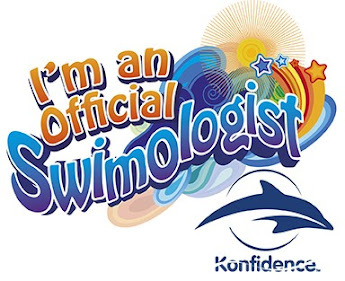 Perhaps I should start hinting! I have to say I am a sucker when it comes to subscription boxes. From beauty boxes, pet boxes to baby boxes they are all the rage at the moment! I had yet to try a food subscription box so when Degustabox contacted me I was very happy to try them out! For £12.99 a month you can receive a box full to the brim of exciting well known and brand new food products. What is in the box each month is a total surprise and I have to say when my Degustabox arrived I was very excited to see what was inside. Quinola Mothergrain Express - £2.55 - We use a lot of express rice in this house so we are looking forward to trying it. We plan on eating it this weekend with salmon fillets and veg. Jules Destrooper Butter Crisp Biscuits - £1.19 - These biscuits were heavenly. So moreish and delicious I ate the whole box in one sitting. Perfect with a hot cup of coffee. Dorset Cereal Berry Granola - £3.79 - We love Dorset Cereal and I was very happy to see the brand in my box. I ate it for my breakfast with lashings of natural yogurt. Great way to start the day. Go! Kombucha Tea - £2.19 - This tea is packed full of live probiotic acids, vitamins, minerals and antioxidents. Extremely good for you. It was a strange taste and I found it almost medicine like but you sort of expect that from something that is so good for you. It is giving your body a good cleanse! Zico Chocolate Coconut Water - £2.00 - I'm not usually a fan of coconut water as it just isn't sweet enough for me but this chocolate coconut version is delicious. x3 Maggie So Juicy - 99p - I see the Maggie adverts on TV a lot and have always wanted to try them out. I received So Tender Italian Herbs, So Juicy Mexican Chicken and So Juicy Sticky BBQ. I plan on cooking up some meals next week with these flavour packets. x2 Goody Good Stuff Sweets - £1.50 - These sweets contain no gluten, dairy, soy or nuts. They are a natural and vegetarian option too. I have tried vegetarian sweets before and didn't like them but I really enjoyed Goody Good Stuff! They still had the chew like most gelatin sweets and they tasted very fruity. Amy's Kitchen Chunky Tomato Soup - £1.69 - This was the first time I have tried anything by Amy's Kitchen. The soup is made from organic ingredients and it was so yummy. It tasted like freshly made soup, you wouldn't of thought it had come out of a can. 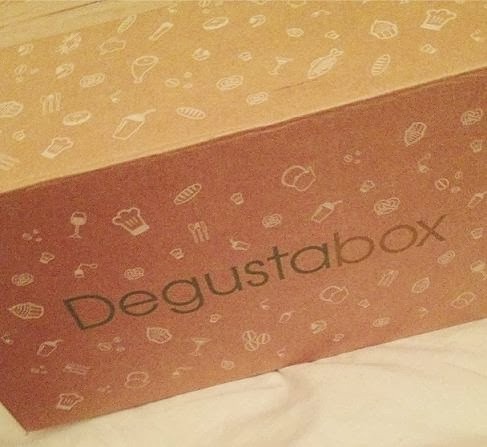 All in all I am really impressed with Degustabox! There was such a variety of products inside, something for everyone all at an affordable price. I would subscribe in a heartbeat, fantastic! 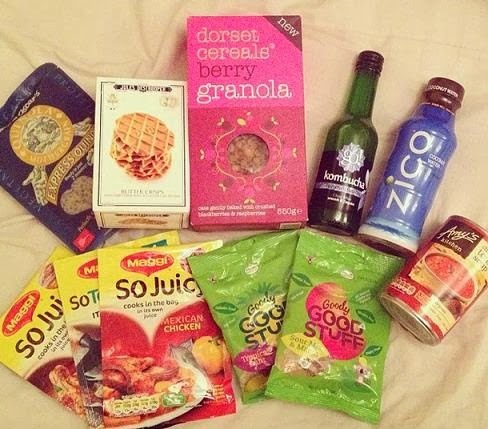 I have a £3.00 off voucher for my readers who would like to try out Degustabox for themselves. Simply enter the code: SG0JN. That's not all. If you would like to win a Degustabox of your own simply enter via the rafflecopter below. Please read the t&c's at the bottom of the page before entering. Good luck! 1. 1 winner of 1 Degustabox. 2. Winner must be over 18 years old. 3. Winner must be from the UK. 4. All entries checked. If an entry is incomplete it will be invalid. - I was sent this product for the purpose of this review. All opinions are my own. We had a good laugh the other night because Noah magically transformed into Iggle Piggle. He has almost growing out of his 0-3m clothing so we decided to try on his 3-6m pramsuit. Safe to say it was massive and you could barely see him beneath all the blue! He will have to make do with the 0-3m for a while longer. This is one of the only family photo we have taken. It's rather bad quality but I love it so much. It was taken on New Years Eve which we spent together. 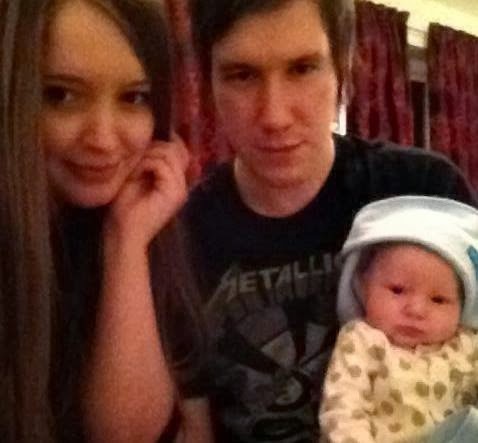 Look at Noah's little face, such a little poser. I love my little family. At the moment Noah is still sleeping in his moses basket beside our bed at night. He has just turned 12 weeks old and he has almost outgrown it. We will be making his transition to cot in the next few weeks but he won't be going into his own room but his cot will be brought into ours. I can't believe my tiny baby is about to go into his big boy cot. We had three ultrasounds in total. One at 12 weeks, a private gender scan at 16 weeks and the 20 week scan. I loved all three of our scan photo's. I still remember our 12 week scan like it was yesterday. That moment when you see your baby on the screen for the first time is indescribable and a moment I won't ever forget. 1. I knew Noah was a boy from the very beginning. I had numerous boy dreams and just had that feeling. 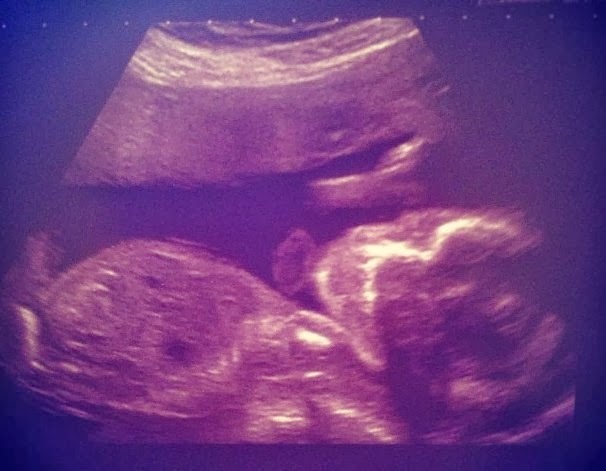 I always wanted a boy first too, so I was very happy to be #teamblue. 2. 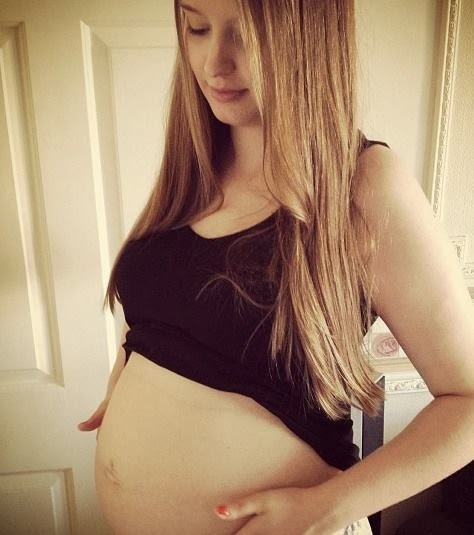 I had a really enjoyable pregnancy, he was a joy to carry and really miss being pregnant. 3. Noah was the only name Nick and I agreed on. Although I did like others, he didn't. 4. We were all expecting a big baby and was very surprised when my 7lb 2oz tot was born. 5. 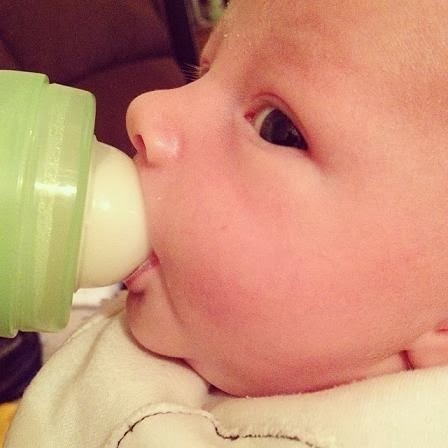 He has always loved his milk and whenever has a bottle it sounds like he really enjoys it. 6. Noah is a real Mummies boy. His need to be with me seems to become stronger everyday. He frequently cries when he is someone elses arms when he see's or hears me. As soon as he is back with me he stops crying. 7. He really fights sleep but once he is asleep he loves it and will sleep for 12 hours. 8. Noah is obsessed with Spongebob Squarepants. When he hears Spongebobs voice or laugh he will stop whatever he is doing and face the TV. 9. He loves to chat, babble and coo. 10. Everyone is obsessed with him and he knows it. He has everyone wrapped around his little finger. 11. His happiest time of day when he has just woken up. His morning smiles are the biggest and when I pop my head over his moses basket he is so happy to see me. 12. Noah's favourite things are blankets. Give him a piece of material to hold and he is golden. 13. 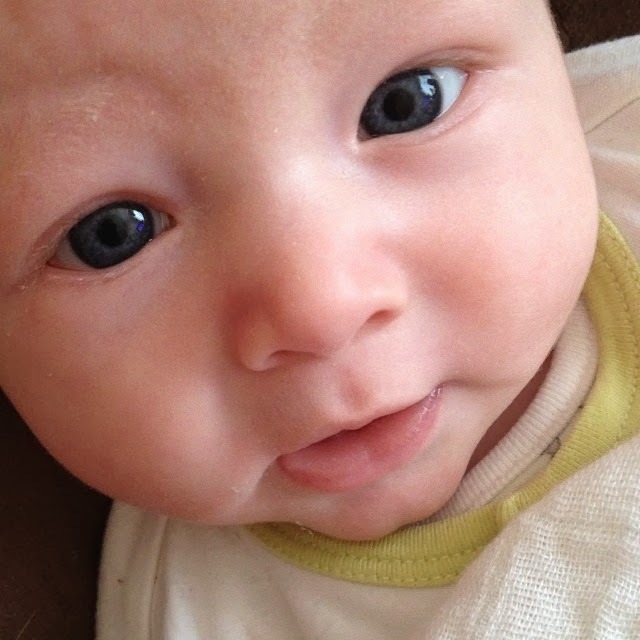 He has the most adorable husky voice but is beginning to master a whole range of noises. 14. 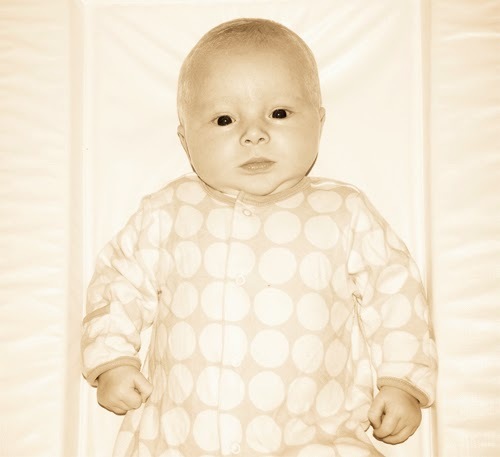 Noah loves his nappy free time and likes to lay on his changing mat in the evenings. 15. He is quiet happy to sit on the sofa cuddled up with me watching American TV shows. 16. He loves to be in the car. 17. Although he can't sit up unaided yet and is still mastering his head control he likes to be sat up like a big boy. 18. He doesn't like tummy time but we do keep trying. 19. He is fairly laid back but if you do something he doesn't approve of he isn't shy about letting you know. 20. At the moment he finds everything Mummy says amusing. 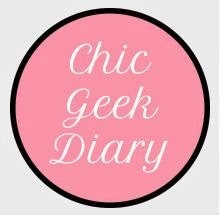 I have been blogging for a while now but still feel like I am new to it all as there is so much to learn. From the jargon, the html, the stats and more. I feel like I learn something new everyday. One thing I know for sure is my blog wouldn't be where it is today if it wasn't for certain media techniques. Twitter - One of the easiest sites to use. Install it on you smart phone or go old school on your pc. You can promote your posts and pages in tweets. But don't forget to use the hashtags! Facebook - Similar to Twitter. Easy to use and you can share your blog posts on your timeline. Instagram - Share photo's from your blog on instagram and link your URL in the description. Easy. 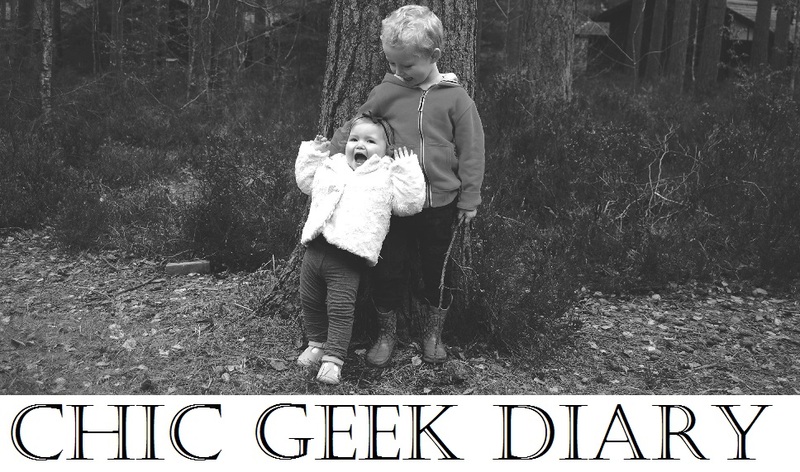 Bloglovin & GFC - The foundation for all blogs. It would be daft not to take full advantages of free social media websites for free publicity. You can create blog accounts on all the social media platforms and then promote your individual posts and blog home page from them. Not only are you attracting more hits to your blog but by gaining new followers and likes you begin gathering a loyal group of blog readers who tune in frequently. Promoting your blog is just like promoting a business. 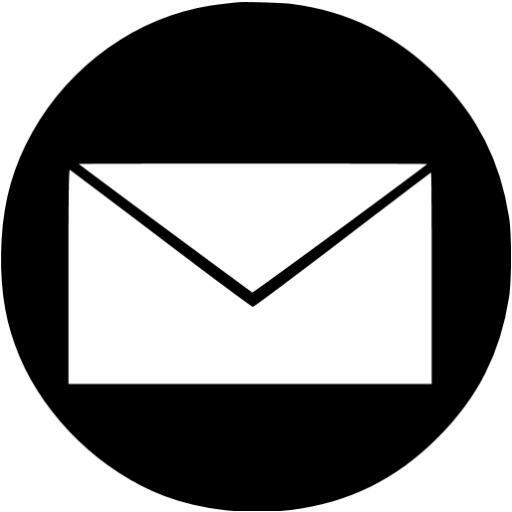 If you are a company who wants to launch and grow you business total media agency is a great place to start. They are a media company who specialise in helping their clients achieve their business goals and ambitions. Noah is now at that stage now where you really know what his likes and dislikes are. He is really beginning to show preferences for certain items and it's so endearing to watch. His favourite things have got to be blankets. Blankets, towels, swaddles, muslin cloths, wraps. Anything soft that he can grab hold of, drag up to his nose and get cosy with is a winner with him. Even when he isn't napping he likes to play with his blankets. He will grab hold of them and flap his arms about. I thought I would share another of his favourites with you, his trusty Nod Pod. As I am a Beebies Baby Store Ambassador I was sent some goodies to review back when Noah was newborn. One of those items was the Nod Pod. The Nod Pod is a soft fleecy baby blanket which has cosy leg compartments. 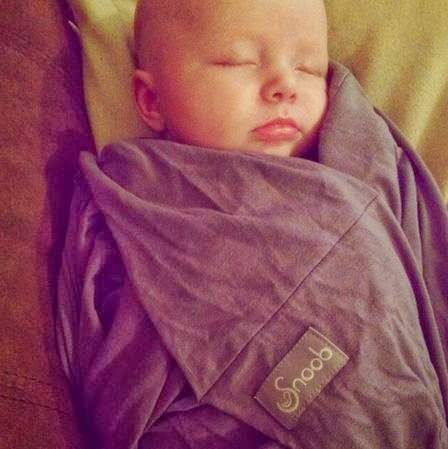 Noah has never liked being swaddled but he absolutely loves his Nod Pod as you can wrap his arms up in it or keep them out. This is great for him as he sometimes likes to keep his arms out and will become agitated if he can't move them about. 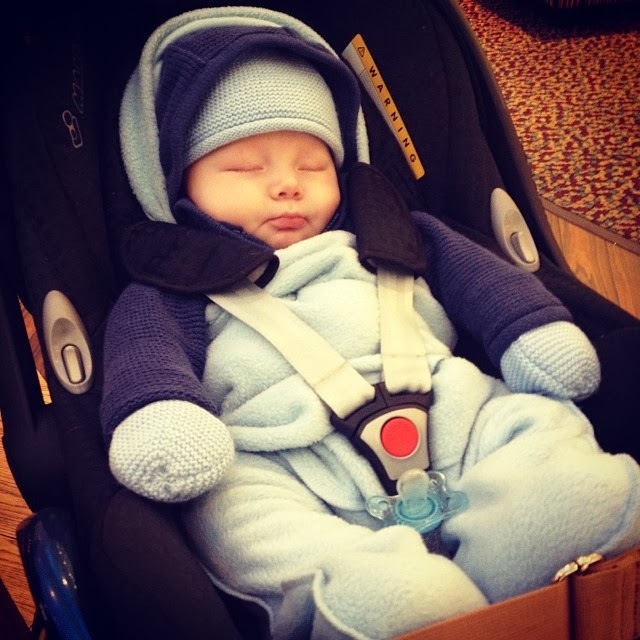 The Nod Pod is safe for car seats and it is so much easier putting him in it rather than a thick pram suit. I can't praise the Nod Pod enough as we use it on a daily basis. Indoors, outdoors, in the car, in his pram! We are always getting comments on where we got it from and how comfortable Noah looks in it. 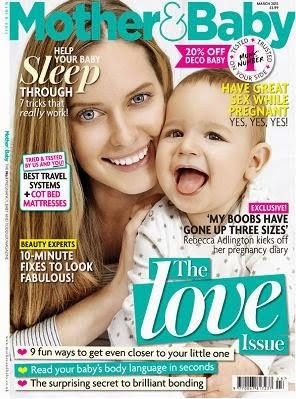 I recommend it to everyone and there is a new selection on the Beebies Baby Store at the moment. Another baby essential in our house. I have always been obsessed with taking photographs. Even as a child I used to buy disposable cameras and take photo's of anything and everything from tree's to my barbie dolls. I studied Photography at college gaining a National Diploma in Photographic Media and I have had a few jobs where Photography played a big role. A long the way I sort of forgot all about my DSLR. I kind of lost the passion for it. It was packed away at the back of my wardrobe and I began relying on my phone for quick snaps. Nick would always ask me why I don't just sell the camera and I always said I was keeping it for when we had children. Now that Noah is here I plan on doing DIY photoshoots here and there. I am kicking myself that I didn't do any newborn shots but I was living in a daze and now can fully concentrate on my old camera. It's like learning to ride a bike all over again.